Massachusetts ranked second among states for the lowest incidence of obesity in America’s Health Rankings for 2013. Nearly 23% of the state’s adults had this health condition, whereas the average rate for the whole U.S. equaled 25.3. Physical inactivity among adults decreased by 3.8% in 2013, and reports of smoking saw an almost 2% decrease. With these improvements in the health of state residents, Massachusetts got the fourth place for overall rank in America’s Health Rankings. Cancer affected 8.600 men and 13,000 women in 2012, with middle-aged individuals registering the most numerous cases in terms of age bracket. Coronary heart disease or angina was diagnosed in 26% of Massachusetts’s senior citizens, and occurred mainly in the state’s southeastern region. Furthermore, 8.9% of males reported having diabetes in 2012 compared to 7.8% of females. Diabetes made the biggest impact on people aged 65 to 74 during this time period. Chronic illness patients can get medical help and long-term care in nursing facilities. According to 2011 data from the Kaiser Family Foundation, Massachusetts accounted for 3.1% of residents in certified nursing facilities all over the U.S.
Below are the average daily cost* of long-term care services in Massachusetts. The couples discount for Privileged Choice Flex, a long-term care insurance product sold by Genworth, saw adjustments that began on April 15, 2013 and affected only new businesses. Meanwhile, Massachusetts Mutual lengthened its transition period for LTCI stand-alone policy updates due to the Boston Marathon incident. The deadline moved from April 25 to May 1. Transamerica started to offer its newer LTCI product, called TransCare III, to adults in Massachusetts on September 10, 2013. TransCare III comes with enhanced features such as higher maximum daily benefit amount and couples discount. Marital and preferred health discounts in MedAmerica’s FlexCare policy, which provides LTCI coverage, underwent revisions on October 12, 2013. 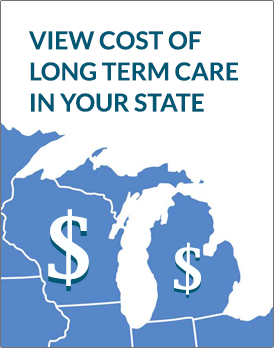 State residents can also buy LTCI policies from American General Life, Bankers Life, Continental Casualty, John Hancock, Mutual of Omaha, New York Life, Northwestern, Physicians Mutual, and Unum Life. Older adults and younger individuals who face disabilities can reduce expenditure for long-term care through the Medicare program. Part A covers skilled care in nursing facilities and home health care, while Part B pays for health-related services and equipment. Medicare expenses can be alleviated through the MassHealth Buy-In, or Medicare Savings Programs. MassHealth refers to the government health program that prioritizes low-income citizens, known in other states as Medicaid. Residents can report MassHealth fraud or abuse through a 24-hour hotline. The program runs a state-based Marketplace called Massachusetts Health Connector, and the state agreed to expand coverage to more citizens beginning January 1, 2014. Programs that help LTC recipients in Massachusetts include the Massachusetts Home Care Program, Group Adult Foster Care, and MassHealth Home Health. Comes with guides to LTC and caregiving, a nursing facility assessment checklist, and other resources. Offers a comprehensive tool for searching LTC facilities, along with tips and resource links.